I'm linking up to the Blogger's Quilt Festival, so follow this link to check out all the other great quilts! As of today, this is the item that I would grab and run with if our house were on fire (once the kids and hubby were safe, of course!) Do you ever do this little exercise in your mind? It's really just a question of what's so important to you that you can't replace? I think a lot of people say it's their photo albums, but I don't have any of those. The fact is that I often come up empty when I think of this. It's a good little reminder to me that every ITEM can be replaced. But people, and the memories you have of them, are a one time deal and you can't go to Walmart for new ones. Actually, there are a few pieces of furniture that are special to me, and as far as value, I'd be smartest to take my sewing machine! But realistically, I'm not going to be hauling them around, so I think I'll settle for this quilt! I can't believe my timing on this one! I wanted to show it to you today, but I think I'll link up to Blogger's Quilt Festival tomorrow and join all the fun. For once my complete lack of planning is working in my favor! How could my favorite quilt of the year (so far!) 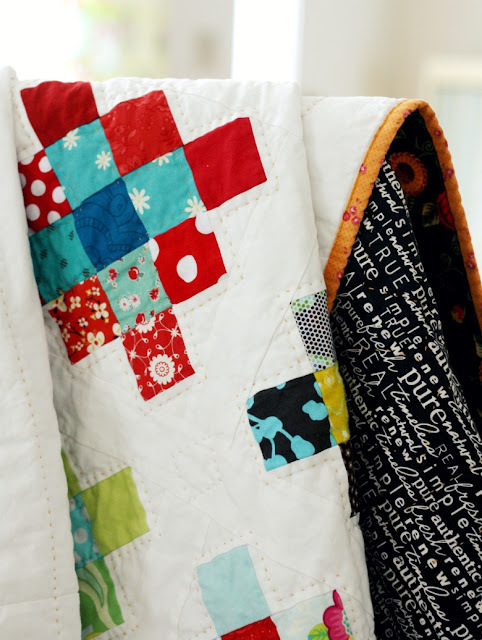 be completed TWO days before the beginning of this fun online quilt show?! Anyways, on to the quilt. I decided long ago that I was going to do simple straight line quilting on this one. I toyed with the idea of doing fun designs in free motion around each basket, but I decided the design was busy enough, and I really wanted to add a simple, modern element to this crazy, busy, happy quilt. I used alternating colors of yellow, pink, and orange thread to quilt it. You don't notice this unless you look real close, but it's a fun bit of added interest. Just a note about these blocks: I know I've gushed about them before, but they are the most.fun.ever. to make. I'd love to show you how to make them, but I used the directions straight from Gwen Marstons Liberated Quiltmaking #2. I'm also on a personal mission to make sure this book finds itself in the hands of every quilter! So go on and buy it, and then make yourself a few of these blocks. I'm sure you won't be dissapointed! I don't use borders that often on my quilts, but I decided this one needed a border. In some ways, this quilt was a study in values for me. Most of the basket background are medium to light tones (with a few darks just to confuse us) and the baskets are mainly medium to dark. Since this quilt is made from a huge assortment of colors, this value placing helps the baskets to stand out. I decided I wanted to border this quilt with dark values, but since I wanted to stay with the scrappy feel I went with strips in darker values. I wasn't completely sure about this while I was making it, but now I'm happy with it. I bound it in this Nicey Jane pink stripe. I would have preferred something dark, like a bright raspberry red, but I wanted it to look nice with the backing, which is a deliciously faded vintage linen (ok, it's an old bed sheet :) but vintage linen sounds better! Yes, you may gasp in terror that I would ruin this quilt with a well used kid's sheet! But I actually was questioning whether this quilt top was special enough for this Strawberry Shortcake yumminess! I've been hoarding this sheet for a long time, because I love it and it's extremely soft. I thought of it right away when I was deciding on backing for this quilt. I was concerned that it would look washed out compared with the brilliant baskets, but it was the perfect size so I decided to go with it. So, I won't ask you if you read all my ramblings about this quilt, but if you did, thanks for listening. And if you make a basket quilt yourself, please send me a link. I'd love to see it! wow! this is beautiful. It makes me want to do a basket quilt myself. I love it! It looks like a lot of fun to make. As far as questioning what I would take with me if our house was on fire, I know exactly what you mean! Our kids are grown and moved out, and once DH and I knew each other were safe, I'd grab my sewing machine, my purse (because I keep so much of my life in there)and probably the most recent quilt I just made, which always happens to be my favorite! DH would probably grab the hard drive from his computer. It not only has his business on it (we both work from hom), but all of our family photos. oh wow! i just love this! so much fun fabric, color and pattern in this quilt. super cute backing! All I can say is ... WOW! This quilt is amazing and the quilting is just perfect. Love it! I love, love, love this quilt. It makes me want to make one right away...You did a AWESOME job! This is a great quilt! It reflects the love that went into it. Well done!! Heck.... if your house was on fire I'd run in to get this quilt! It's fab-u-lous! Love the 'vintage linen' backing too. Bet it's so cozy. You are doing a great promo job for Gwen Marston.... I ordered the book on the strength of 'your' quilt. It arrived this week... great book. Now I need to get some yummy fabrics to make my own basket quilt. Thanks for making and sharing your baskets. I read every word you wrote! I absolutely and utterly love this quilt. I bet it is choc full of memories. I have LQ II, but I never considered making the liberated baskets...until now! I *love* your quilt! Thanks for the inspiration. That is so cute!! I LOVE the colors. wow, this is an eyeful of wonderment! Your Marston/Moran influences are apparent☺ and I bet either one of them would want this hanging in her studio for inspiration! It might be made from directions, but hey, it's your color and placement choices that make it come alive!! This is one of those quilts that comes around once in a lifetime--thank you for sharing! The quilt is gorgeous and I love how you debated whether the quilt was special enough for the strawberry shortcake "vintage linen". I wouldn't think they would go together, but you made them sing in harmony! Well done! What a bright and cheery quilt! I really like the border you added..and the pink binding..and the stawberry shortcake is perfect! The vintage linen backing is perfect, as is the border - good choices! It's beautiful, I love that the baskets are all individual! Ok you convinced me I'm going to have to get this book then maybe I can get liberated - Do I burn my bra now or am I just showing my age? Oh, Jolene, this is just the best quilt. And mission accomplished--I have Gwen Marston's book in my library. I enjoyed your whole discussion of the process here, value placement, etc. Awesome quilt! wow, wow, wow! Amazing, funky, cool quilt - I love it! I want one! Best so far!!! (Blogger is still doing odd things! I'm surprised I can comment at all!) Fabulous quilt- I love the colour and the cute little baskets! SOunds like I need that book too! great post! I love baskets. This quilt is great. The fabrics are so pretty and I like the way you photograph - the extreme CU and then backing up a bit. I love how the fabric whimsy seems to be just the way it should be. You are right grab the quilt on the way out the door - it is worth it. Yep! read every word! its absolutely gorgeous, as are ALL your quilts. I love the backing , i love using "vintage linens" on the backs of mine and the Strawberry Shortcake print is perfect! Wonderful basket quilt. Your use of fabric is so playful. This is a favorite of mine - so lovely! OH my gosh I love this quilt - and I can't believe it, but I'm also working on the same thing, lol! I'm doing the Sand Pails, so my fabrics are tropical and beachy. This is just gorgeous Jolene! I love the scrappy border, you were right to use it. And I ALWAYS use a vintage sheet to back my quilts - I can't afford to buy backing out of quilt fabric! I also use a flannel sheet for batting, I like really thin quilts. I love your basket quilt -- it's so cheerful and scrappy and the sheet on the back is just perfect. I've got some sheets that I'm hoarding for the right quilt tops to come along. And thanks for sharing where you got the pattern. I just went and addded Liberated Quiltmaking 2 to my wish list at Amazon so I won't forget about it. Words cannot express how much I love and am inspired by this quilt. A traditional pattern that has been modernized in the best way. Love it. What a happy quilt! I LOVE it! I love your amazing quilt! the vintage linen is absolutely perfect on the back. Your quilt is full of gorgeous fabrics. So, so wonderful, I love the quilt! I, too, am making baskets from Gwen's book, I even got to take a workshop with her last month. She is such a delight. I think if my house was on fire I would grab my recipe box, full of recipes written by generations of family and friends. OMGolly!!! This is stunning, and so wonderful and fabulous!! I love it. All those colours and baskets! And then to top it off you have Strawberry Shortcake on the back, That is sooo cool! I love the book, and I love this quilt....just lovely. Hello? That sheet is vintage, baby! That is the original Strawberry Shortcake; not the newfangled 'hip and styling' teenaged acting Strawberry Shortcake of today! Yours is the one I rememember, sigh... showing my age! Oh yeah, love your quilt! Oh wow. I can not imagine how much work that took! I'm a new quilter and just doing a simple square inside a square block takes me ages. lol! This is gorgeous, I love all the bright colours and seeing all the beautiful prints you have used. I have the book but haven't made anything from it yet. Your quilt is so fresh and lively. I love the colour and the design. It works so well. Great quilt! Gorgeous... love your fabric choices ! What a great basket quilt!! I love this quilt so much I can't stand it. I want to be like you when I grow up. I'm only 53 years young! Thanks for the great inspiration! Pretty, pretty baskets. I'd grab it and run, too! I love this quilt. The border finishes it perfectly. Such a cheery, happy quilt! Love it! Yes. A very happy quilt! wonderful! WHat a joyful quilt. Love all the fun novelty prints, the freeform baskets and of course the strawberry shortcake sheet ;) too fun. I've come back almost every day since you posted this quilt just to take another look! I love it! I have Gwen's book and this is one of the quilts I so want to take the plunge and just do. Did you make your baskets over a long period of time, or go to town on them all at once? Fantastic quilt! I would definitely take this if my house was burning. But now you've got me thinking, what would I take? Anyways, I love that you used the Strawberry Shortcake sheet on the back. It gives it a vintage look. Thanks for sharing! Stunning quilt!! Just love it!! I love this basket quilt - and I really love your attachment to it. I think everyone should want to grab their quilts if there was a fire. I also have to say that I gasped at your backing. I had those sheets as a kid and LOVED them. Now, I need to go through my mom's closet to see if she still has them. LOVE IT!! So cute! I love the fabrics, the bright happiness and joy. Wonderful job. Gwen Marston completely rocks - I love her too. The Basket quilts you've shared are so sweet. Love the colors! (found you via A Little Bit Biased blog). Thanks for sharing the pics. Just looking through my Pinterest boards and came across this quilt. Beautiful! Love the vintage sheet backing, too. I have one of these started, so you've inspired me to take it on retreat next weekend and see if I can get it finished! Me gusta mucho el colorido de tus quilts, como un día de primavera. love this quilt - its the one I'd take too ! I have Gwen's book but I've never made anything from it - this quilt has just been put at the top of my 2015 to make list - thanks for sharing your gorgeous quilt !